There are several varieties of huckleberries found across the United States, and most of them are considered difficult to transplant. When grown from cuttings or seeds they can easily take up to 15 years before they produce berries. Successful transplanting can be achieved if elevation the plants grow at is taken into consideration prior to transplant. Some huckleberry varieties will thrive at 2,000 feet elevation but others require over 6,000 foot elevation feet to thrive. Dig up huckleberry transplants from late fall to early winter. State and federal regulations should be checked prior to digging up wild native huckleberries. Insert a shovel a foot out from the stems of the huckleberry. Gently dig around the plant and then lift it from the dirt. Place the plant in a 5-gallon container of peat moss. Firm the peat moss around the root system of the huckleberry. Water the pot thoroughly. Grow the huckleberries in a the container for one to two years prior to transplanting into the garden. Earlier transplant will normally result in the plant's death. Choose a transplant location that offers frost protection for the plants. Huckleberries can withstand deep snows and cold temperatures but if the temperature falls below 28 degrees F during blossoming then the plant will need protection. 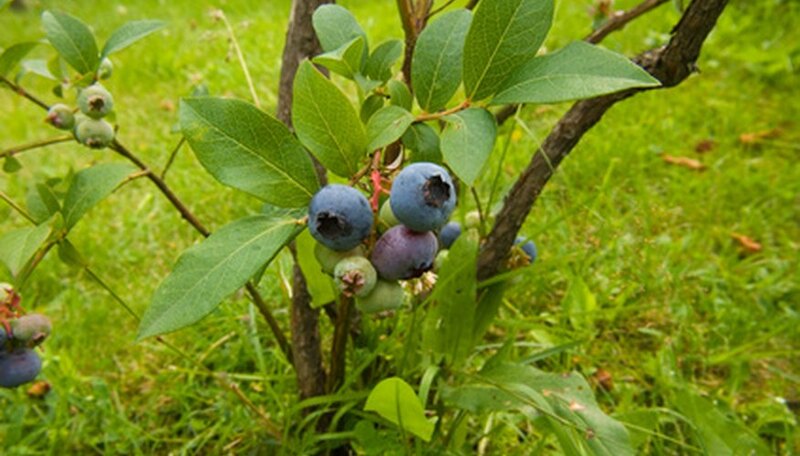 Raised sites are ideal for planting a huckleberry so the cold air moves away from the plants. Plant in full sun for best berry production. Planting soil should be a sandy loam and the addition of volcanic ash is beneficial to water retention. Mix 30 percent organic matter such as peat moss or sawdust into 70 percent garden soil prior to transplanting the huckleberries. Huckleberries prefer acidic soil to flourish. The addition of peat moss and organic matter such as leaf mulch or sawdust can help the soil attain the needed pH. Adding agricultural sulfur to the soil prior to planting will also increase the acidic content. Follow the application instructions on the label. Dig the transplant hole twice as large as the five gallon container the huckleberry has been growing within. Gently remove the huckleberry from the container and place it into the hole. Cover the root system with the soil and organic matter mixture. Tamp down to remove any air pockets. Water thoroughly. Apply 2 to 3 inches of peat moss mulch around the base of the huckleberries to keep soil moist and also keep weed growth back. The V.deliciosum variety of huckleberry is the easiest to successfully transplant of all the varieties. All huckleberries grow from a rhizomatous root system but the V.deliciosum offers sturdier roots and a denser system which makes transplant easier and more successful. Fertilize huckleberry plants in May, June and July using a granular 10-10-10 fertilizer. Apply 2 to 3 inches of steer manure around the base of plants every spring. Never burn a field of Western huckleberries.